Andy Samberg's Conner4Real discusses some of his musical influences in our exclusive deleted scene from the new Lonely Island comedy Popstar: Never Stop Never Stopping, ahead of its Digital HD release on August 16. This deleted scene, which comes from the Interview Outtakes section of the bonus features, showcases Conner going through his CD collection, claiming he listened to all of the "classic s--t" while he was growing up, "real music" like Bob Marley and Edie Brickell. As he keeps going through his list of "classics," it seems clear that Conner isn't too familiar with what defines a classic artist, with some questionable choices on his playlist. Andy Samberg stars in this hilarious comedy as a former boy-band member trying desperately to salvage his failing solo career, coming to Digital HD on August 16, 2016, On Demand on August 30, 2016, and Blu-ray™ and DVD on September 13, 2016, from Universal Pictures Home Entertainment. This side-splitting comedy goes behind the scenes as music sensation Conner4Real (Samberg) finds his popularity plummeting after a disastrous album release, leaving his fans, sycophants and rivals all wondering what to do when he's no longer the dopest star of all. Popstar: Never Stop Never Stopping on Blu-ray and DVD comes with over an hour of outrageous bonus features, including deleted scenes, a gag reel, celebrity interview outtakes and more! Andy Samberg is Conner4Real, the breakout star of a popular but disbanded hip-hop group, whose life and career go off the rails just as he launches a highly publicized solo tour. 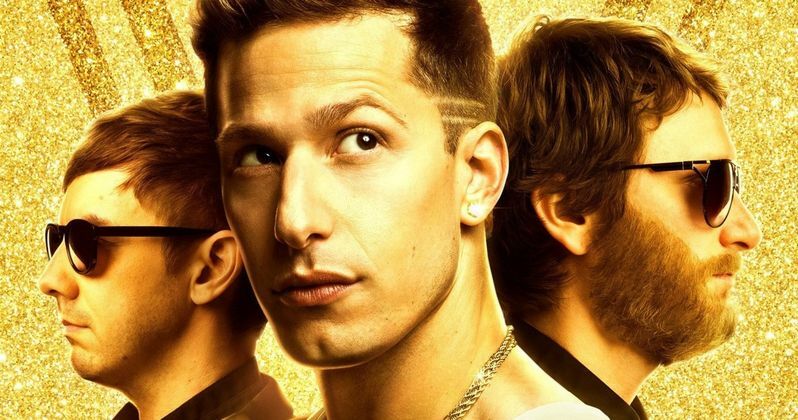 Written by Lonely Island co-founders and SNL alums Andy Samberg, Akiva Schaffer and Jorma Taccone, and co-driected by Schaffer and Taccone, this razor-sharp, music-filled sendup of pop celebrity chronicles the exploits of the lovably egotistical singer-rapper (and his 32-person entourage) as he attempts to win back the hearts of his once-adoring fans. Comedy mastermind Judd Apatow (Knocked Up, Anchorman: The Legend of Ron Burgundy) produced the film along with Andy Samberg, Akiva Schaffer and Jorma Taccone, the comedy collective known as The Lonely Island (I'm on a Boat, Lazy Sunday), who also wrote and star in the film. They are joined in the cast by a who's who of comedy superstars, including Sarah Silverman, Tim Meadows, Maya Rudolph, Joan Cusack, Imogen Poots, Chris Redd, Bill Hader, Kevin Nealon and Will Arnett. Popstar: Never Stop Never Stopping delivers laugh-out-loud cameos from such music-world VIPs as Justin Timberlake, Adam Levine, Pharrell Williams, Carrie Underwood, DJ Khaleed, Seal, P!nk, Nas, Usher, Snoop Dogg, 50 Cent, Ringo Starr, Simon Cowell, Questlove, Mariah Carey, RZA, T.I. and "Weird Al" Yankovic. The Blu-ray and DVD includes bonus features such as 45 Minutes of Deleted Scenes, Gag Reel, Interview Outtakes, Bonus Footage, 6 Music Videos, How to Donkey Roll, Big Boy Freestyle, Shooting Hoops, "Turn Up the Beef" Backstory, Fun at CMZ! and more. The film will be available on Blu-ray with Digital HD and UltraViolet™ and DVD. Blu-ray unleashes the power of your HDTV and is the best way to watch movies at home, featuring 6X the picture resolution of DVD, exclusive extras and theater-quality surround sound. DVD offers the flexibility and convenience of playing movies in more places, both at home and away. Digital HD with UltraViolet lets fans watch movies anywhere on their favorite devices. Users can instantly stream or download. Take a look at our exclusive clip below, and stay tuned for more on Popstar: Never Stop Never Stopping. Will Ninja Turtles 2 Be a Bigger Box Office Hit Than Expected?